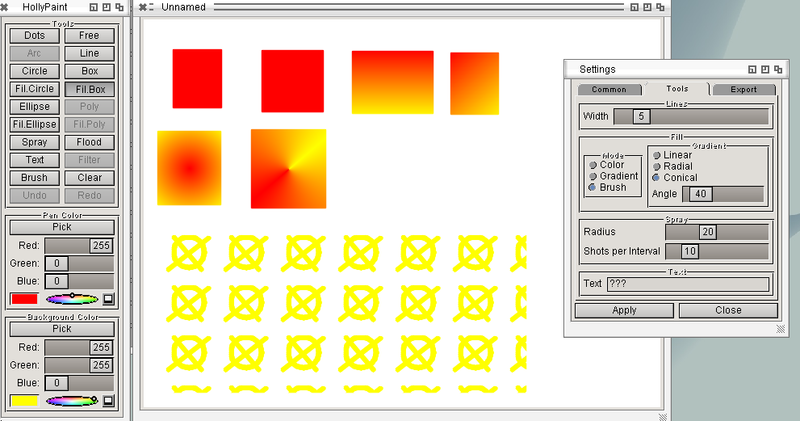 in HollyPaint I'm using a Hollywood object within a scrollgroup/virtgroup. To get mouse clicks in the Hollywood object I have added a traditional Hollywood button with event handlers. That doesn't work well anymore since HollyPaint has become a multi window application . If I click a gadget in the toolbar window  and then click into the canvas window a MouseX call within the event handler returns sometimes a negative value. That causes crashes because some graphics functions can't deal with negative values. There is probably a conflict between MUI  and Hollywood event handler. Catching negative variables isn't an option because toolbar and canvas window can overlap. Does this problem go away if you use a normal group instead of a virtgroup/scrollgroup? The problem doesn't happen if a manually activate the canvas window before clicking in it. Ok, can you make a very small example test case? Then I can check this issue. It turned out that it isn't necessary to have a 2nd window. Just click somewhere on the desktop to deactivate the MUI window, then click again in the window. I get always an alert message. If I activate the window before clicking in it the coordinates are correct. I cannot reproduce this on OS3, OS4 and MorphOS so it looks like a Zune issue. Ouch. Do you have an idea what's missing in Zune? Well, it seems that Zune forwards IDCMP events to the custom class where IntuiMessage.MouseX and IntuiMessage.MouseY are smaller than the _mleft() and _mtop() offsets of the MUI object. MUI Royale subtracts _mleft(obj) from IntuiMessage.MouseX and _mtop(obj) from IntuiMessage.MouseY and then injects these relative coordinates into Hollywood's event handler. So if you get negative coordinates for MouseX() or MouseY(), then the IntuiMessage that is sent to the MUI object by Zune contains some bogus values where IntuiMessage.MouseX or IntuiMessage.MouseY are smaller than _mleft() or _mtop() respectively.